The mayor of Harrisburg, Penn., ordered his police department on Friday not to provide security for an upcoming NRA-sponsored gun show after the association refused to meet a demand to pay a 60-percent increase in fees for the service. Harrisburg police have provided security for the annual Great American Outdoors Show, scheduled this year for February 6-14, in the past. 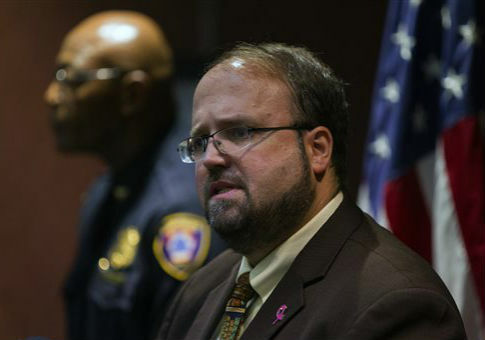 Mayor Eric Papenfuse said that the decision not to offer the department’s services this year was motivated in part by the NRA’s opposition to the city’s gun control policies. "We have an epidemic of gun violence," Papenfuse told WHTM. "It’s no secret that the NRA has worked against the city’s interests repeatedly over the past year causing us to spend tens of thousands of dollars to defend common sense gun ordinances. We don’t need to be doing them any favors." An NRA spokesman said that despite payments of $600,000 directly to the city since 2014, the mayor wanted the gun rights group to pay additional fees in order to obtain police protection for the show. "Unfortunately, demands were made by the mayor for the 2016 show that included a 60 percent increase in fees to [the police department] to work the show and a requirement of a $50,000 grant for five years to the city," Jeremy Greene, an NRA spokesman, said in a statement. "This offer was presented as all or nothing. If we did not accept, the mayor would pull [police] support." Greene said that the NRA offered to increase its donation to the city in exchange for police patrols of the show but the mayor’s office wasn’t satisfied by the amount offered. "We are disappointed our more than generous offer was declined, but we are mostly disappointed that the officers we have worked with the last two years will be the ones most hurt," he said. The mayor’s office said that the move was also part of an effort to redeploy police to combat gun crime. "The city has been in the middle of what it considers a crisis in young people, especially, being involved in gun violence in our city," said Joyce Davis, the mayor’s communications director. "He wants to redeploy some of these police officers to have extra patrols in the city." Davis said that the move was not politically motivated. "It is not a question of politics, it is a question of saving our children," she said. "We care about them, the NRA may not." The show will proceed as scheduled, the NRA said, despite the absence of Harrisburg police. Officers from nearby Dauphin County and other local police departments will provide security. This entry was posted in Issues and tagged Gun Control, NRA. Bookmark the permalink.